Today in Sunday school Gregory learned about how God’s two angels visited Abraham’s nephew, Lot, in beautiful downtown Sodom. It’s based as loosely on Genesis: 19: 1-10 — if you’d like to follow along. One day, the Lord decided to do some evil-people spring cleaning so he sent two of his right-hand angels to Sodom to destroy every man, woman and child who lived there. When the angels got to the gates of Sodom, Abraham’s favorite nephew, Lot, was waiting for them. As they approached, Lot jumped up and ran over to greet them by bowing down before them. Lot: Welcome Angels!! Hope you didn’t have any trouble finding the place. My wife’s got a big bowl of water ready so we can wash your feet. We know how much you angels love a good foot washing. And then my wife will prepare you a fabulous dinner. Angel #1: What’s she making? Angel #2: Out of what kind of meat? Lot: Good question. You know I never thought to ask. Angel #1: Oh. well in that case, thanks for the offer but we’ll just spend the night out in the open, here in the Sodom city square. I’m sure we’ll be fine. Lot: Listen Angels, I wouldn’t advise that. Lot: I’ll spare you the gory details, but everyone who lives in Sodom is horribly depraved. Angel#1: Really, you mean they don’t always return their library books on time? Lot: It’s worse than that I’m afraid. 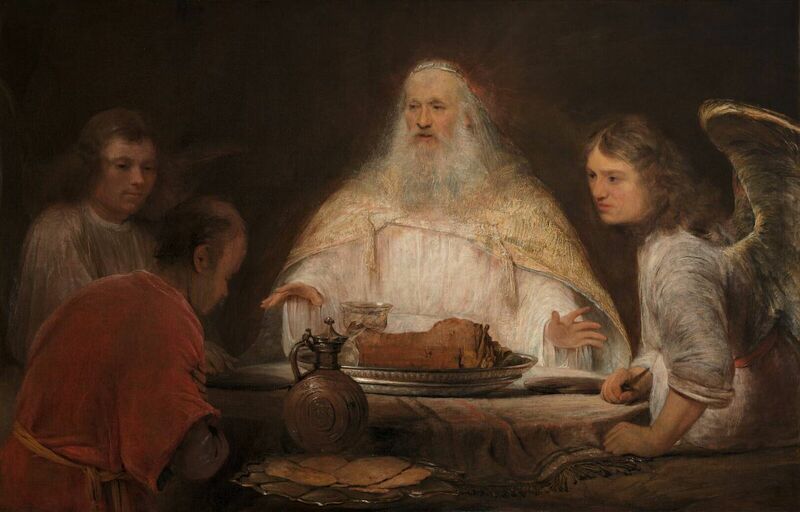 Angel #2: You mean they sneak and eat the last piece of Angel food cake without asking first if the Lord wants it? Lot: Worse than that even. Angel #2: Gasp! Choke! Gasp! The angels fumbled around in their between-wing backpacks until they found their asthma inhalers. Then they all sat down and rested awhile and got to know each other better. They were in the middle of exchanging their funniest foot-washing stories when it started to get dark. Lot: Aha ha ha! . . . and you thought the bowl of dirty foot water was the soup? . . . ahaha . . . oh you guys are killing me. Ha ha ha! Ahhhhh! But hey it’s getting dark, angels, we better hasten to my house and bolt the door shut, move the dresser in front of it, roll a huge boulder in front of that and then get the elephant to shore it all up with his trunk. Angel #1: Sounds like somebody got a new home security system! Lot: Yeah and if anybody breaks in and rapes us, we get one month free! Angel #1: Wow! That a great deal. So Lot and the two angels high tailed it over to his house. Lot’s wife and daughters had just finished preparing the tacos and were sitting in the corner busily perfecting their foot washing techniques on the elephant’s feet and marveling, once again, at how handy it was to have an elephant around the house. Angel #1: Those were great tacos, Mrs. Lot. Mrs. Lot: You thought so too. Angel #2: What kind of meat was that, anyway? Before Mrs. Lot could answer, an angry mob began pounding on Lots door. Angry Mob: It’s us. Sodom’s angry mob of men, young and old. Lot: What do you want? Lot: Have them go with you to return your library books? Angry Mob. Yeah that’s it. Lot: Well I have two daughters who could help you with that. They’re virgins and spend most of their time at the library, so they know the fastest way there. Lot’s daughter: Dad! Stop it! You’re embarrassing us! We don’t want to help them return their library books! Lot: One more word out of you, young lady, and I wont’ let you clean up after the elephant anymore. Angry Mob: We’re going to keep pounding on this door until you open it. Lot: What shall we do? Angel #1 to Angel #2: We could strike them all blind. Angel #2 to Angel #1: That’s a thought. Lot: Or you could strike all of us deaf, and then we couldn’t hear the pounding. Mrs. Lot: But then we couldn’t hear the elephant, if he needed us. Angel #1: We could strike them so they can’t taste or smell anything. Lot’s Wife: How about striking us so we can’t smell anything. Lot’s Wife: If you have to ask, you’ve never lived with an elephant. Angel #1: Let’s just go with my original idea to strike all of them blind. Lot: Okay fine. But they’re pounding on the door already. Won’t they still know where the door is? Angel #2: I think I hear your elephant calling. And there you have it, Dear Readers, what Gregory learned in Sunday School today. Be sure to check back next week when the angels destroy Sodom and Lot’s wife becomes a pillar in the community. Holy Rollers! Sarah’s Bad Hair Day! Welcome Dear Readers to this week’s edition of the Gregory’s Bible Stories. Today in Sunday School, Gregory learned about how Abraham got a surprise visit from three men with some unbelievable news concerning his wife, Sarah. This week’s story is loosely based on Genesis 18: 1-15 if you would like to loosely follow along. One hot biblical afternoon in the Sacred Trees of Mamre, Abraham was sitting in the entrance of his tent trying to get cool. The air-conditioning (hand-cranked) was on the blitz due to the fact that all his hand-cranking slaves were out sick with carpal tunnel syndrome. Abraham was just sitting there relaxing, unraveling some stray threads on his robe when he looked up and saw three men standing nearby. When Abraham saw them. he ran out to greet them and bowed to the ground. Abraham: Well hello there fellows! It is me, Abraham, you’re humble servant. Take a load off under that tree over there, while I’ll run to fetch some water to wash your feet. Not that they need it, or anything. Abraham: Oh and I’ll also bring you some food so that you may refresh yourselves. Three men: We sure could use some lawn chairs while you’re at it. Abraham: Tell me about it! Unfortunately my lawn-chair-weaver slaves are out sick with osteoarthritis. Three men: Very well, just get us some food and wash our feet then. Abraham: Sarah, quick! Get out the best flour and bake some bread, get all these tent pillows picked up, this place is a sty! And, you, slaves with the carpal tunnel syndrome! Look alive! Abraham: We’ve got important visitors. Oh, for heavens sakes, Sarah, why are you still wearing curlers in your hair when it’s eleven o’clock in the morning? Abraham: Don’t tell me. Carpal tunnel syndrome? Sarah: No I think it’s tendonitis. Abraham hurried out into his herd of cattle and picked out a calf that was tender and fat and handed it over to his barbecuing slave. Abraham: Here you go barbecuing slave. Take this calf and cook it for the visitors. Make it medium rare and don’t forget to baste it. Abraham: Don’t tell me. Tendonitis? Cooking Slave: No I think it’s Repetitive Strain Injury. Three men: Where’s your wife, Sarah? 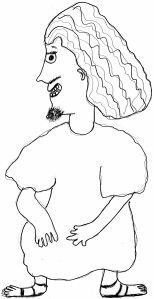 Abraham: She’s in the tent, she’s having a having a bad hair day. One man who later turned out to be the Lord said: Nine months from now I will come back and your wife Sarah will have a son. When Sarah overheard this revelation from inside the tent, she laughed to herself because not only was she too old to have a baby, Abraham was 99, and Viagra hadn’t even been invented yet. The Lord: Why does Sarah think she can’t have a baby? I just heard her laughing to herself inside the tent. Is there anything too hard for the Lord? As I said, nine months from now I will return and Sarah will have a son. Sarah: I didn’t laugh, Lord. The Lord: Oh yes you did, Sarah! I heard you! Sarah: What? No, that’s the sound I always make when I have to yank out my own curlers. It’s more of yelp than a laugh. The Lord: I know laughing when I hear it, and you were laughing. The Lord: Yes you were! 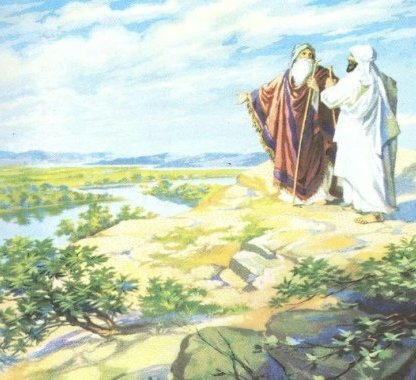 Abraham: Hey you two! What difference does it make? 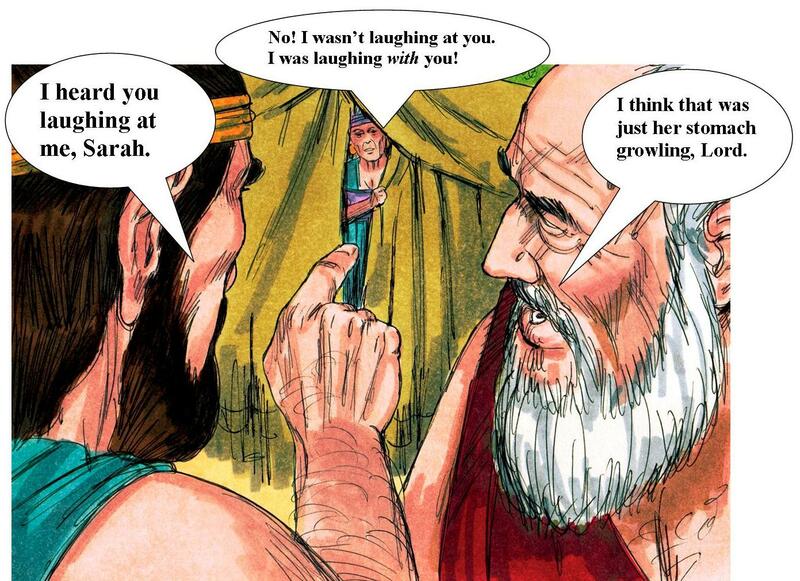 It’s not like thousands of years from now people will be reading in the bible about whether or not the Lord overheard Sarah laughing . . . . The Lord: Well I suppose you’re right. Abraham: That’s the spirit! Now, who wants another foot washing — raise your hand! The Lord: I’ll take another one. The Lord: Repetitive Strain Injury?. Abraham: No I think it’s Carpal Tunnel Syndrome. And there you have it, Dear Readers, what Gregory learned in Sunday School today. Please check back next week when Abraham tries to think of something positive to say to say to the Lord about Sodom.